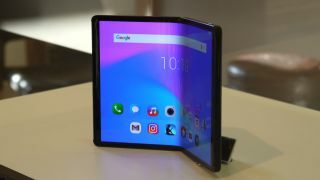 Electronics manufacturer TCL, the brand behind Alcatel and BlackBerry smartphones, has confirmed at MWC 2019 that it will launch a foldable phone in 2020 which won't cost anywhere near as much as the Samsung Galaxy Fold. It also had a concept foldable smartphone on show in Barcelona, Spain, although it was behind glass so we couldn't physically touch it or try it out. It wouldn't be drawn on just how much it's planning to charge, but it did tell us that it won't be producing a device which costs anywhere near $2,000 (the price of the Galaxy Fold). A TCL spokesperson told us "it's not important to be first. We don't want to rush or be the first [to launch a foldable phone]. We want to bring something to the market that's really accessible and useful for the user." That's why we won't see TCL, or its Alcatel or BlackBerry sub-brands, launch a foldable phone in 2019. It's happy to play the waiting game, see what rivals launch and then offer something more cost-effective next year. First up is the flexible display, which it has produced itself (with the help of sister company CSOT), so it won't need to rely on the likes of LG or Samsung to supply the panel - this could help to keep the cost down, but will likely mean a reduction in quality in comparison to those South Korean giants. While we were able to see the foldable display and hinge in the flesh, it's not clear how far TCL has got with developing the software. We hope it does a lot better than the Royole FlexPai, which suffered from major software issues when we got hands on with it at the start of the year. The concept we got to see was snazzily named the TCL DragonHinge, which is a pretty awesome name for a phone if you ask us, but that's highly unlikely to be a name used for the final device. It's technically the name for the patented casing and hinge TCL has created for its flexible displays, rather than the device has a whole. We'd be surprised if the foldable concept phone we saw is the final device which launches next year, as it appeared to have a high-end spec line-up, including a 7.2-inch QHD+ (2048 x 1536) AMOLED display and four rear cameras - which doesn't sound very affordable to us. While the folding form factor is similar to the Samsung Galaxy Fold, there's no additional screen on the front (when folded), which means you'd have to open it up whenever you wanted to use it - potentially another cost-saving measuring.